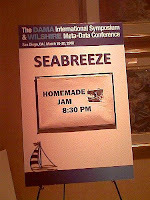 The DAMA conference would not be the same without the annual Homemade Jam se ssion. DM musicians entertained a crowd on Monday night. The line-up included improvisational blues to sing-along favorites such as "Brown Sugar" and Pat Benatar's "Hit me with Your Best Shot."